Following the recent announcement of the festival's very own 'Discovery Day', Swn can now happily reveal its final wave of acts set to play at this year's bash. Joining the already impressive line up will be LA-Producer wunderkind DAEDELUS, London indie outfit ISLAND and MATT MALTESE, not to mention much-loved Bangor group YR EIRA and Hengoed natives NITEROOMS. "Discovering music, venues, places, people, language and the city is a key part of what makes the festival magic. We’re proud that all of this is still happening as part of Sŵn." explains Sŵn Festival organiser John Rostron. "We’re delighted to announce the full line-up and are really excited to be able to bring such an eclectic mix of musical talent to Cardiff. Discovery Day is definitely going to finish Sŵn off with a bang!". 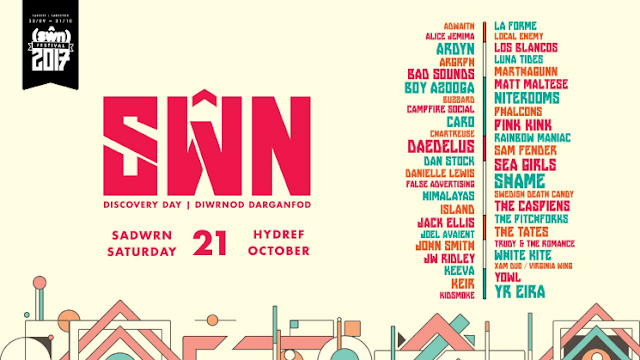 Swn's 'Discovery Day' will take place Saturday 21 October, a night which goes hand in hand with the festival's month long line up of live music and events. A full run down can be found below. Wristbands for Sŵn Discvery Day are on sale now priced at £30. Tickets for all other shows can be found here. For more information and to get your tickets, go to swnfest.com. Follow @swnissound on Twitter.